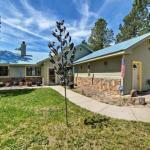 Situated in Pagosa Springs in the Colorado region iVACAZ - Pagosa on the Golf features accommodation with free WiFi. Each unit features a fully equipped kitchen with a microwave a seating area with a sofa a flat-screen TV a washing machine and a private bathroom with bath or shower. A fridge and coffee machine are also featured. A ski storage space is available on site and both skiing and hiking can be enjoyed within close proximity of the property. The nearest airport is Durango-La Plata County Airport 63 km from the property.